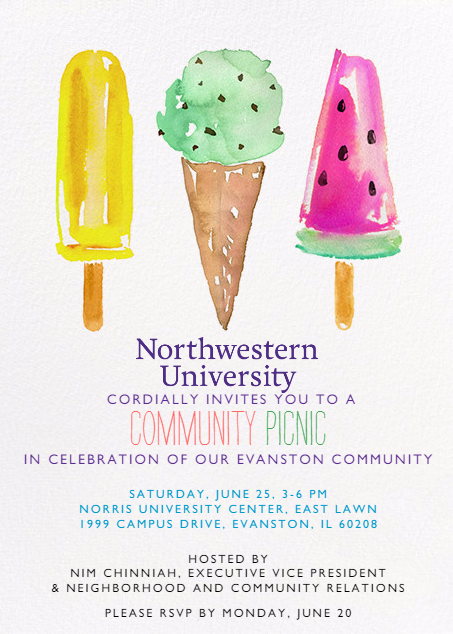 Everyone is invited to celebrate our Evanston community with our friends at Northwestern University on Sat., June 25 from 3-6 p.m. at NU’s Norris University Center, East Lawn,1999 Campus Drive. The community picnic will feature free food from local restaurants Hecky’s Barbeque and Andy’s Custard. Bring your family and enjoy music, face painting, a bounce house, and more. Click here to submit your RSVP. Please RSVP by Mon.,June 20.